Last week I was at Leeds University, giving a lecture on 13th century Asia-Europe connections at the annual International Medieval Conference. As I wandered around at lunch break, a plaque on a wall caught my attention. It was not on a main path, or very noticeable. But somehow my attention was drawn. 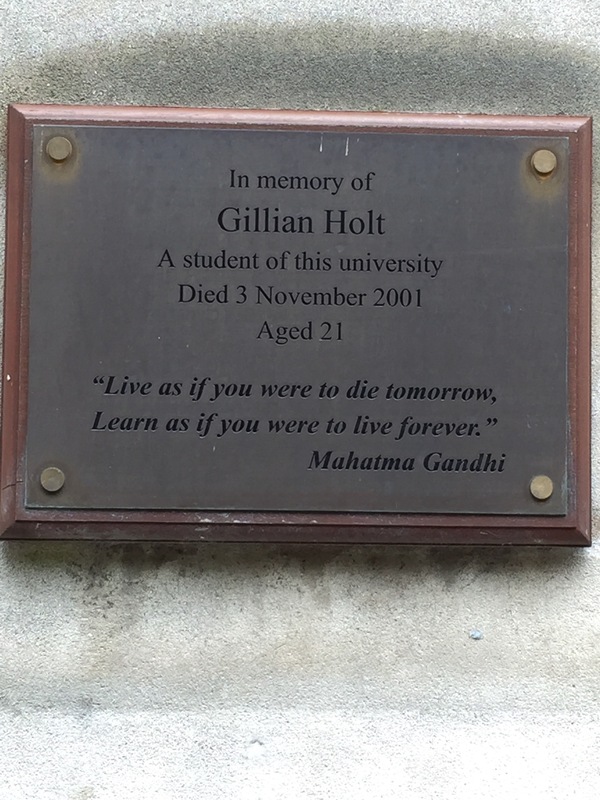 I do not know Gillian Holt, except that she was a student of Leeds and tragically died at age 21. We know she died on 3 November, 2001. That is all the inscription tells the passerby. Yet Gillian is lovingly remembered and honored. She will never be forgotten at Leeds University, or of course in the hearts of her family and friends. Yet I must confess, what drew me to this wall memorial to a 21 year old was the quote inscribed on it. A quote by Mahatma Gandhi, one I had never heard. “Live as if you will die tomorrow, learn as if you will live forever.” Somehow having this quote with Gillian’s remembrance made me wish I ‘d known her. It gave me the impression that Gillian, though living a short life, had a rich one of learning. This week I got news that a wonderful woman of faith, who had been so generous over the years to my wife and I, had died at the age of 102. Lois so wanted to die much earlier and join her beloved Harold, who passed away over a decade ago. She lived a long, rich life, devoted to teaching music, her friends and family, and her Lord Jesus. Two different lives, one lived a short life, one a much longer one. But likely both very rich in their own ways. Lois was very prepared to die any day, yet she kept learning and loving until the end years when her mind weakened. I have no idea about Gillian. But somehow I hope that she was learning up to the moment of her death, however it took place. Learning every day in any way we can, whether through books, people, life events, or a million other ways, brings a richness and an open generosity of spirit. I am a fanatical learner. I even love to smell books, a quirk that thankfully I passed on to our two daughters. This week when I walked into the Bodleian library in Oxford after being away two years, the wonderful smell of lots of books captivated me. We all need to be prepared to die. But we also need to be prepared to learn, and go on learning. I like to think that learning will go on forever, however that may happen. Mahatma Gandhi was right on this, as he was on so much else. Whoever put this quote on Gillian’s memorial, thank you. It honors her, it makes me wish I knew her. And that is one of the most wonderful things a memorial can do. I wish I knew her story. But Gillian’s rich life reaches out to us today, and it will continue to do so as long there is a Leeds University wall honoring her. I love the vision, but right now I’d just like to stop unlearning. Thanks for your comment. Just wondering what you mean by wanting to “stop unlearning”? I’m sure good conversation around that!! I travelled from Liverpool to Leeds this morning for a Campus Tour, and Gillian’s memorial caught my eye as soon as I saw it. Through looking at an old student newspaper from 2001, I found out that Gillian was a second year French and Economic student. She was diabetic and suffered a hypoglycaemic fit in her shared student house, which tragically killed her. Such a sad story, but a beautiful memorial to a student.